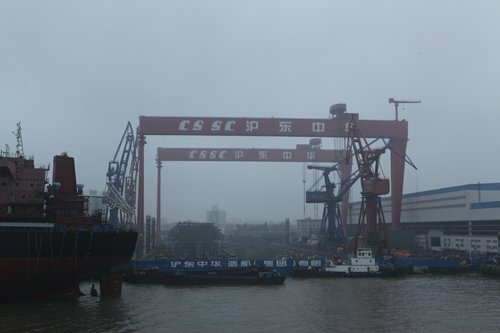 China State Shipbuilding Corp (CSSC) won orders from CMA CGM Group, a leading global shipping group based in France, to build 10 15,000 containerships of 20-foot equivalent unit capacity. The approximate total value of the orders is $1.2 billion, according to a report by domestic media eworldship.com on Sunday. However, an industry analyst said the deal is unlikely to be a reason to change the overall gloomy outlook for the global shipping industry. The orders may be the first large containership orders so far this year. The vessels will be built by Jiangnan Shipyard Group and Hudong-Zhonghua Shipbuilding Group. The shipping industry has been going through a difficult time. The sector has been struggling with a surge in market supply, followed by low charter rates. Consequently, there have been several high-profile bankruptcies, including that of South Korea's largest container line, Hanjin Shipping, in 2017. Liu Wei, former analyst from the Economic Research Institute under CSSC, said the orders from CMA CGM don't necessarily indicate a revival or turnaround in the containership business. "The slowdown of the global economy and the ongoing US-China trade friction have negatively impacted overall demand in the industry," Liu told the Global Times on Monday. "In 2019, the ongoing lack of demand will very likely still dominate the industry's outlook. There are uncertainties over the horizon that the industry should be prepared for," Liu noted.